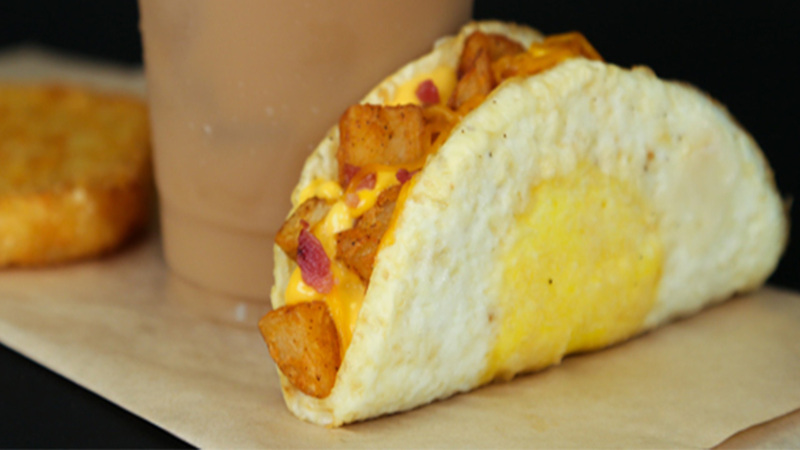 IRVINE, Calif. -- Calling all breakfast lovers, Taco Bell is turning breakfast inside out with their new "Naked Egg Taco." On Tuesday, the company revealed their latest shell innovation which they're calling a breakfast "game-changer." The new menu item is a shell made entirely of a fried egg and it's anything but a snooze fest! But what kicks this taco up a notch is that it flips a morning classic inside out by delivering a mouthful of crispy potatoes, bacon or sausage, and cheese tucked in a fried egg. Officials said the taco will be available nationwide beginning August 31. "The Naked Egg Taco strips down the traditional breakfast taco, allowing us to deliver a new flavor experience in every single bite," said Liz Matthews, Chief Food Innovation Officer at Taco Bell Corp. "Shell innovation is at the core of where we experiment - and whether it's crispy chicken, biscuits or waffles that wrap up menu item classics - we bring our fans craveable and unexpected food experiences that leave them wanting more." For the first time ever, fans in select cities will have a chance to reserve a table inside Taco Bell and taste its newest menu item leading up to the nationwide debut. Taco Bell is hosting fans across the country beginning August 17 with brunch-esque "Bell & Breakfast" events to give fans the chance to try the latest menu item innovation. Events will kick-off in New York on Thursday and will continue with experiences at Taco Bell restaurants in Laguna Beach, CA (August 25); Austin, TX (August 26); and Chicago (August 27) IL. Reservations are now available exclusively through OpenTable and additional seatings will be released leading up to the menu items debut. Fans unable to score a seat are encouraged to follow along using the hashtag, #NakedEggTaco and keep an eye out for future experiences presented by Taco Bell. This revamped take on a breakfast staple is available for a limited time for $1.99 or in a breakfast combo that includes a coffee or medium drink and two Cinnabon Delights or a hash brown for $3.99.